So, a friend (not sure if they want to be identified in this context so I'll wait) has asked me to take some photos of her kiddo, her parents, her hubs and her in prep for a full family holiday card at the end of the year. She likes the pics I've been taking of Alita and Music Baby so she asked me and even offered to pay me something. I declined payment. It's exciting and fun for me and an important learning experience so I'm getting paid already. Anyway, I need to learn a bit more, shoot a bit faster and be able to take more photos at a time before our date with destiny in June. I need more freedom to make mistakes and I need the immediacy to try different techniques on the same subject to learn which ones work best. I need the digital equivalent of my beloved but ailing Nikkormat. I just spent about $2,000 on the show so the idea of spending over $1000 on a camera seemed crazy indulgent. As a precursor I was going to go to a famous camera store and get some advice then hit Ebay or Craigslist or whatever to see if I could find a reasonable pre-owned option. Anyway, after the snow day changed my plan on Friday I hit the web site for store hours on the weekend and discovered a USED SECTION! I am at this point so excited I can barely contain myself. Today, y'all, by today I might have a big kids digital camera. I can't wait! Go for it! And take lots and lots of pictures, and then go play with Photoshop too! I've resisted putting money into a camera because, while I really enjoy photography, I rarely take the time to do it and it simply can't take the prominent place in my list of activities that would be required for me to feel like a new camera would be a prudent purchase. My own advice to myself has been that, if you'll use it and you can prove you'll continue to do so, go get it. Enjoy your toy! I look forward to seeing all the wonderful pics! 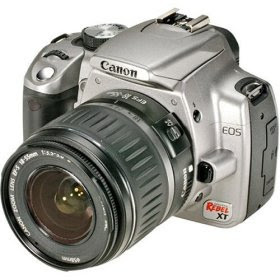 I have the canon 20D which is very, very similar to the Rebel. You. Will. LOVE. it. Love it. I'm waiting to buy another camera, too. It's a delicious feeling and I cannot wait. Seester, the guy showed me how the lens from my Nikkormat changes what I get out of the new camera and WOW. I can see what you're saying about the lenses. Kitty, do you (or does anyone) know where I can get someone to give me a short tutorial on all the gazillion buttons on there so I can start to work manually with some confidence? I sort of get it but I'd love for someone to go shooting with me and give me some pointers.